Although they are very different in other ways this reminded me of another “Doctor-lite” episode, “Love and Monsters”. While the Doctor doesn’t have much screen time in either, his presence hovers over everything that happens, casting a shadow over the entire story. While it may be that the rarity of these episodes, I would love to see more of them because they bring into focus the way the Doctor changes the lives of everyone he touches, even when it is only a brief encounter, and sometimes he really does seem a bit cavalier about it. That’s a good point – to me, the Doctor is (almost always) like a puppet master. There’s a sense that he (almost) always has control of the situation, even when he doesn’t appear to. But in the Doctor-lite episodes, you can SEE this. It’s a tangible thing, because otherwise the episode wouldn’t work! I love the Doctor as an easter egg in this episode, the way he “Shows up where he’s not supposed to be.” I think it’s a great way to sum him up! I agree – and it’s a sign of how iconic David Tennant as the Doctor has become that those few glimpses of him are so surreal and exciting. I was determined NOT to like Tennant, Jo, but ended up loving him just like everyone else 🙂 Although having said that, second time around it is interesting to watch for the arrogance he plays in the Doctor, which makes him somewhat less likeable! I have to say that the Weeping Angels are probably the creepiest of the New Who monsters for me. I find them genuinely scary, even though really, what they do is not as horrible as some – just relocate you to another time. No pain, no carnage, just the opportunity to live out your life somewhen else. Sure, you have to leave all your friends and family behind, but still… And yet they are sincerely terrifying! This episode is such a horror movie. The Angels are seriously creepy (there’s a cemetery on my drive to work and thanks to Blink I cannot help but glance at the angel on my way past…). The old house has a haunted quality to it — statues that move, noises from upstairs, shadowy basement and unexplained writing on the wall. The musical score and direction only emphasise it. Billy is an amazing character – and he comes across in just three scenes. Sally’s friend Kathy is much the same – there’s a whole world in each of their performances, and we only get fragments of greater lives that are hinted at. The idea of a monster that kills you using your natural lifespan against you is brilliant and awful. Both stories of displacement were wonderfully told, I thought. Whether it was the letter from Kathy, or Billy’s death bed scene, there was a real emotional resonance. And the interesting thing is that both of them still managed to find a great deal of happiness in their altered lives, so on first examination you might almost think that what the Angels did to them wasn’t actually that bad. But, the terrible thing is that the Angels didn’t give them any choice in the matter, they simply took their future away without care for the consequences. Their victims’ lives could have just as easily ended in desperate loneliness as happiness, and whatever good came from it is due to the character of Kathy and Billy, not anything the Angels did. 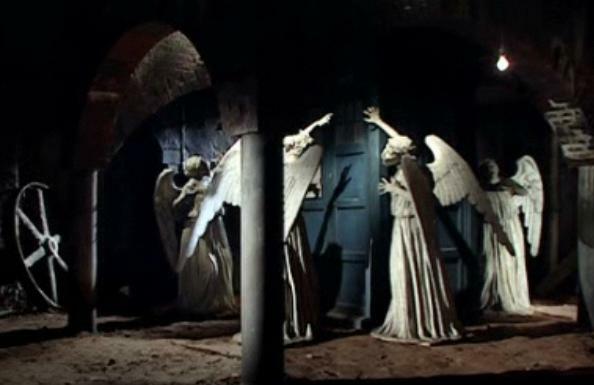 The key thing of course is that the Weeping Angels are no real threat to the Doctor – he could just hang around and wait. But that isn’t how he works and more importantly, having Martha with him ups the stakes because if she loses 40 years of her life, that’s a big deal. I thought the only real weak spot in this episode was the ending. It could have quite easily finished with them walking back into the shop, with Sally finally able to let go and move on with her life (something people who encounter the Doctor can’t always do! ), the statue montage seemed a bit gimmicky and cheap compared to the rest of the episode. It’s a small quibble though, I can see why this episode inspired t-shirts (hmmm, there’s an idea…), it is exceptional. I’m willing to put up with the occasional Slitheen if it’s the price we pay for the other end of the scale. I don’t know, I kind of liked it – a nice creepy touch to finish it off! I could have done without the statue montage. Sally doing what humans do, and getting on with her life would have been a stronger place to end it. There were echoes of the Seventh Doctor in Ten here, as well, and I am thinking especially of Curse of Fenric and the idea of the Doctor as a bit of a manipulator of people and events. He really does set up the Angels as if it were a game of chess, moving all his pieces into position perfectly. Of course, the pieces are people. It also helps having Sally’s package of info, nothing like being a few moves ahead the whole time! It’s cool that ultimately, Sally saves the day! The doctor relied on her and her package of info to know how to move all his pieces. I shall take this opportunity to add to the chorus of Sally-love! Really the Doctor isn’t actually manipulating anything – it looks like he is throughout, and it plays on our acceptance that he does that sort of thing, but really it’s Sally that instigates the matter and he is just doing what he’s told. Which is quite a clever twist. I think the history of the Doctor as the great manipulator helps with the fake out, though! I thought the device of the DVD easter egg was really cool! And cleverly done too – I mean, we know the Doctor can jump about and find out what went on as he pleases, but to have it be Sally who provides him with the information – nice touch! What about the best friend? Narrative device or essential part of the story, do you think? TANSY: Essential! Kathy is the reason that Sally is so determined to get to the heart of the matter – otherwise she’s just a bored girl playing at being a sleuth. Also that moment where the letter arrives and Kathy hasn’t actually LEFT YET – chilling! JO: Oh absolutely — so chilling. And sad. This initial friendship between Sally and Kathy is vital to the episode. As mentioned, it gives Sally a reason to keep searching for the truth, and really hits home for the viewer just how disturbing the Angels are. Sally has to go on without her. And she can’t even say goodbye. Essential, definitely. Her fate gives us an idea of the stakes, it gives Sally a real reason to pursue her investigation no matter what obstacles get in her way, and it sets up one of my favourite scenes of the episode with the delivery of the letter. And, the moment Kathy realises where – and when – she has ended up is is wonderfully written. If it had been a stranger, or peripheral character, it wouldn’t have packed such an emotional punch. Thanks for joining us, it’s been fun!